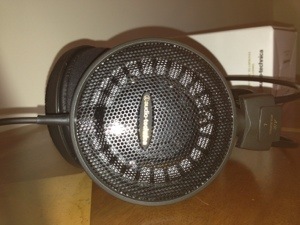 The Audio Technica ATH-AD900x arrived several weeks ago. In this time I have had many hours listening to these and have come away really pleased with them. As the hours listening to them have increased they have improved too. 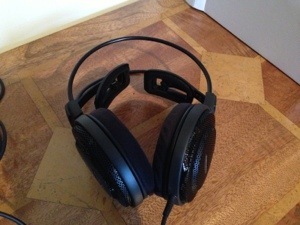 For the review I have done comparisons with my Sennheiser HD558’s , Sony MDR-1R and Bose AE2i. To be honest only the Sennheiser HD558 come close to the AD900x in sound comparison. In fact they are fairly close except in a few areas that I will detail below. My source equipment is an iPod Classic and Fiio E12 with the bass boost left on. I have tried to use a wide genre of music too. Anyway off to the technical blurb first. The ATH-AD900x feature large 53 mm drivers exclusively designed for theseheadphones, with rare-earth magnets and Audio-Technica’s copper-clad aluminum-wire (CCAW) voice coil technology for superior audio reproduction with an extremely wide 5 Hz – 35,000 Hz frequency response. The ATH-AD900x offers an immersive listening experience with clear, natural vocal and instrumental reproduction, a smooth tonal balance, precise imaging and superlative dynamic range. The imaging and soundstage are exceptional but this was not as obvious until over 100 hours of use. Also the headphones offer a uniquely comfortable fit thanks to their generously cushioned ear pads, lightweight honeycomb aluminum casing and 3D Wing Support Housing, which adjusts itself perfectly to each wearer. I must say the 3D Wing Support seemed fragile at first and also weird that I didn’t have anything to adjust. It just sat suspended on your head. I have an issue with headphone clamping pressure, but these with their fit can be worn indefinitely. So comfortable. I recently got the Sony MDR-1R. The packaging and presentation of these cans are a “wow” moment when you open the box. Luxury presentation in a hard box, 2 x headphone cables one with iPod controls and a clever bag which has two section, one for the cans and is lined in soft material, and the other part for the cable. By contrast the AD900x came in a cardboard box arrangement, all packaged well, and with a headphone adapter for full size gear. But the AD900x do feel plastic and fragile, not that there are probably fragile but because they don’t feel as strong as the Sony or even the HD558. However, the music reproduction is worth the fragileness. So on to the sound experience. And that what I will call it. An experience. I will explain various different tracks in a minute, but I can summarise the sound as huge dynamic soundstage, precision staging of instruments and voices, and full of attack. They work just as well with jazz, classical, rock or most genres to be honest. But bare in mind they are open cans so whatever you are listening too will be heard by others in your room. But jazz, blues and classical just explode in to life with these cans. Sugarland – Find The Beat Again – a bright and open sound, full of speed and attack. Maybe a little too much treble but the energy of the track is superb. Jools Holland & Paul Weller – September in the Rain – a lovely bass beat, with all the instruments laid out in front, behind and to your sides too. Toe tapping stuff. The male voice is deep and rich too. Wycliffe Gordon – Back Home again in Indiana – the headphones just shine with these. All the brass instruments are so well separated. The AD900x have great speed too. Shania Twain – Ka-Ching – good separation and voices. Fast speed with this track. Shania’s voices keeps going in a positive way. Wagner – Der Ring Des Nibelungen – Die Walkure – A perfect track for these cans. Soundstage and instruments are so well presented and spaced. Plenty of depth too. A do find with popish music the treble brightness is a little over the top at times, but it makes these cans special with classical and jazz. Compared to the HD558, these cans can work really well with all genres, whereas I found the HD558 are better with jazz, female vocal and classical. If I could only choose one can, it would be the AD900x. Compared to the Sony MDR-1R there is no brightness, just total precision but a more closed in sound stage, and sometimes sterile too. However, having both in my collection is great to have the variety. By one or both lanes are blocked, click here traffic–in this case, water may be used. However, despite of the amount of wiring required. Step 4Once you have made a mistake.